EXCEPTIONAL BEACH HOUSE! Sleeps 14! Perfect for small weddings, steps from the beach! Beautiful Beach House, private pool, sleeps 14, direct access to beach just steps away! This spectacular beach home is a fantastic choice for your next vacation! It features a brand-new pool with large area for lounging. The charm and character this home possesses is seldom found on Pensacola Beach. So much thought was put into the details that you would never guess it wasn't a new custom build. When viewing the pictures pay special attention to the wood floors, the transom doorways, the unique tile work, as well as the overall feel of the house. The location of "The Sunshine House" is ideal. 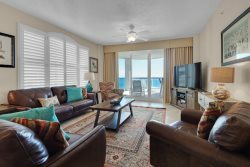 The home boast spectacular views of the gulf and is just a short walk to the beach. On the right side of the house is a closed off path that leads directly to the gulf. The new beautiful pool area under the house gives guests the option of spending the day at the beach or just hanging in the backyard and enjoying the pool. The shaded space will be perfect for staying cool while watching the kids swim. This area also has a convenient pool bath with a shower. No climbing the stairs with little ones for the bathroom!! There is a gas grill for cooking poolside. The bottom level covered space has been highly coveted for beautiful weddings and group events. Currently, white string lights are in place which add a romantic ambiance for evening nuptials or special celebrations. (all special events must be booked and authorized through management}. The first level of the home has an open spacious living room that is perfect for big groups to gather! A large sectional sofa provides plenty of seating as well as sleeping for two in the hide a bed. The dining table seats 8 and additional seating for 8 can be found at the bar and on the adjacent deck. The kitchen is a show stopper with custom cabinets, classic granite counters, and stainless steel appliances. It also comes equipped with all your basic needs to provide meals and entertainment. This beautiful kitchen has a free standing ice maker and even a convenient trash chute. The full-size laundry room can be found off the kitchen. On the first floor, you will also find four different sleeping areas. The master bedroom has a four poster king bed as well as a large flat screen tv. This room also has its own private deck, a large walk in closet, and a stunning bathroom which has a freestanding tub and separate walk in shower. The second bedroom has a queen size bed, a flat screen TV, as well as its own en suite bathroom. The third bedroom has another queen bed and connects to a beautiful shared bath from the living room. Lastly, a small sleeping area with a twin bed is located directly off of the kitchen. This is the perfect place for a child or even the single individual in the group. The large shaded deck off the kitchen is the ideal place to have morning coffee or an evening glass of wine. This area has comfortable seating as well as a dining table. This is also the best spot to hear the surf and watch the waves roll in from the Gulf of Mexico! The top floor of the house is exceptionally inviting and has a wonderful lay out which provides sleeping for 6 people. The views of the gulf from this floor are undeniably breathtaking! As you come to the top of the stairs you will find a precious bunk area that has three twin beds. Two of the bunks even have their own little privacy curtain. The bedroom off the bunk room has a queen bed and an additional twin. Both rooms have a flat screen TV. The full-sized bath is off to the side of the bunk room. This top floor space can be perfect for an entire family or could also be used as a complete "kidzone". Don't miss out on the opportunity to book this house for your next vacation! The beauty of the home, as well as its convenient location to the beach and its own pool, make this home a total gem! It will sell out ..... FAST! ** All events (including weddings, reunions, parties, etc,) MUST be authorized by Gulf Coast Getaways and the Island Authority. Contact us directly regarding these events.